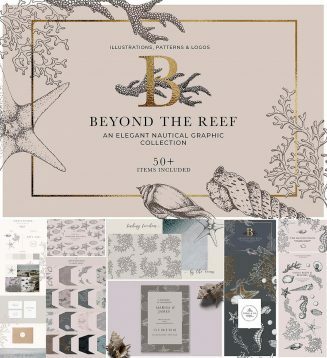 Introducing a modern and elegant collection of maritime illustrations and graphics inspired by the sea. Intricate drawings of corals, seashells and more mix with subtle patterns, bringing a fresh breeze of salty air to your designs. Add effortless elegance to your beach wedding invites, luxurious branding or home collection – start creating right away with an all-in-one set of nautical graphics. File format: .ai, .psd, .eps, .jpgvac for Photoshop or other software. Tags: artistic, coral, feminine, floral pattern, marine, nautical, pattern, reef, sea, shell, vacation.